I've been sharing cards weekly over at the Scrap'n Stamp blog, but thought I'd share some of the Christmas cards I've made recently in the days leading up to Christmas... We are struggling a bit this year, trying to find the Christmas spirit so there's definitely a bit of a Blue Christmas feel! We both love the holiday but this year, there's struggle with missing loved ones who are far away from us physically or who have left us for their heavenly home. My hope is that we can find the simple joy of those we love who are here with us... there is much to celebrate, even when we don't feel like it! 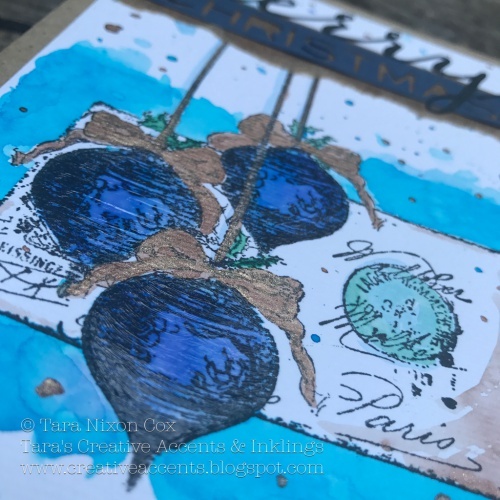 Anyways, I thought I'd start with my blue Christmas card, featuring a stamp by Impression Obsession, dies by Tim Holtz/ Sizzix and watercolor painting with Colorburst. 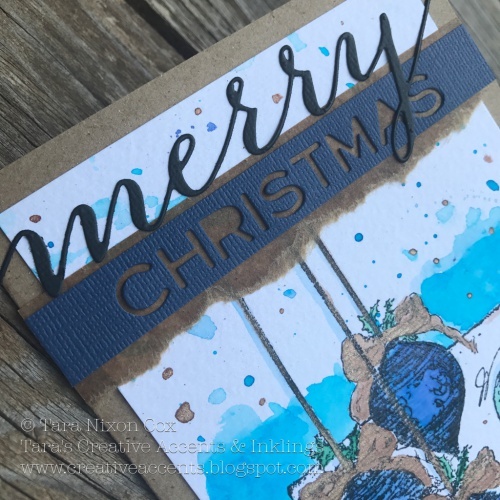 I stamped the ornament collage image in black Archival ink on watercolor cardstock, then misted water onto my craft sheet and squeezed a small amount of ColorBurst into the puddle. I mixed and painted with a brush, gradually adding more water and color to get the desired look. I’ve used two different shades of blue, plus a touch of green and a mix of sepia (brown) and cooper (metallic). I wanted to add something extra to the ornaments, so decided to try painting on some transparent texture paste. It’s a unique look, with very visible brush strokes. Kinda cool… but I think I’ll stick to good ole Glossy Accents next time 🙂 I do love that copper shimmer in the bows, though! And it looks fabulous in my splatter spots as well! 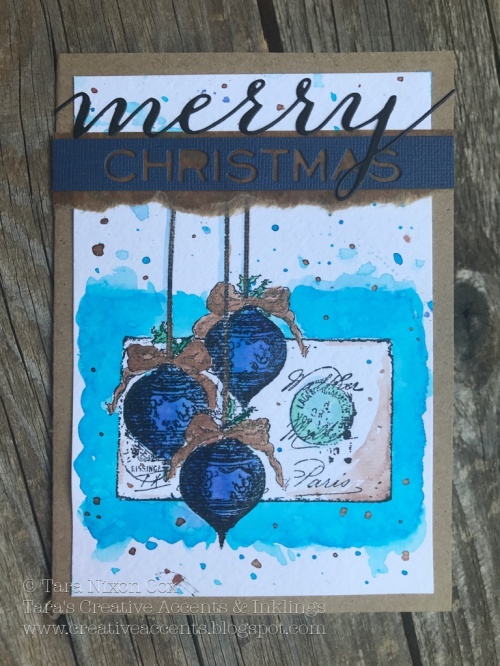 The title is a combo of a positive cut of the ‘merry’ die by Memory Box and a negative cut out of ‘Christmas’ by Tim Holtz/Sizzix. I love these together, and added some torn kraft glassine paper behind them to add some extra dimension. 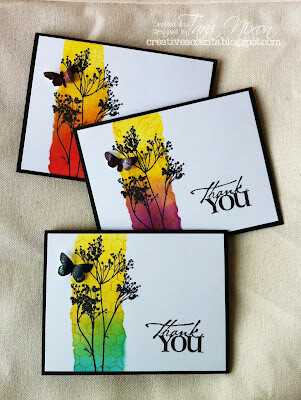 I really love how the card came together... BLUE isn't always a bad thing... sometimes it can be quite beautiful!